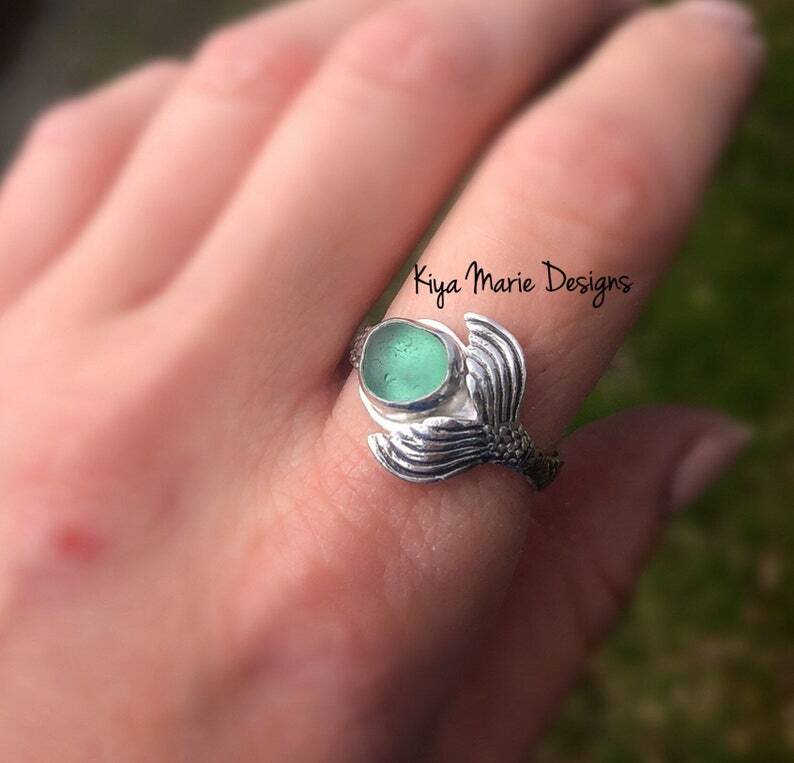 A gorgeous, new ring style to match my best selling mini mermaid necklace! A glowing piece of sea glass has been bezeled in recycled .935 argentium silver and combined with a sterling silver mermaid scale band. A sterling silver mermaid tail has been wrapped around the bezel to complete this ring, like a mermaid guarding a sacred treasure. All components have been oxidized to highlight detail. I have selected 35 pieces of genuine sea glass from Iceland, England, Puerto Rico, and California to choose from for your own custom ring. Each ring is hand crafted and hand finished by me. Use the drop down menu to choose your piece of sea glass. Each photo has a number, and each piece of sea glass within the photo is numbered. All pieces are $98 with the exception of the rares which are $120. Please use the drop down menu to choose the corresponding photo and number to the piece you would like. Please choose your size from the second drop down menu. Please allow 2-3 weeks from order date for completion of your ring, this style has been heavily requested! This is a perfect gift for the beach lover, or for yourself! The ring will come wrapped safely in a gift box and will be shipped via USPS.